VNAs and cloud technology are opening up a lot of possibilities for health care organizations. As vendor neutral archives (VNAs) evolve, health care organizations are beginning to view them differently. What was once mainly seen as a storage solution is becoming an important workflow component. One problem with VNAs, however, is that implementing them onsite requires significant resources and expertise. Most large, university-affiliated health systems have either adopted or are in the process of adopting a VNA, but smaller health care organizations may not have the in-house IT expertise or the capital budget to implement one onsite. One way to manage these limitations is to incorporate a cloud component in the VNA playbook. The allure of a cloud-based or cloud-assisted VNA is that it mitigates the need for two separate data centers, reduces capital expenditures, and often comes with significant IT expertise built into the contract. Michael J. Gray, principal owner of Gray Consulting, says many organizations already use the cloud for data backup, but slower upload and retrieval speeds have made it less desirable as a primary archiving option. He adds that, historically, many organizations have been reluctant to loosen their grip on organization-generated data, but as the cloud has proven increasingly reliable in other industries such as finance and retail, concerns about data control and security have become less pronounced. For many organizations, Gray says, cloud-based options may be the only way that they will be able to access the benefits of a VNA. "It's probably the only way that smaller health care organizations are going to be able to deploy [a VNA]," Gray says. "Somebody once said that only big organizations need VNAs. Wrong. Every health care organization needs a VNA to facilitate the level of data exchange that is becoming requisite, not only inside facilities but [also] between facilities." With increasing emphases on interoperability and data access, VNAs can play a critical role in standardizing image data. Even though many vendors employ the DICOM standard, Gray says there's still variation among products because DICOM allows vendors to add proprietary tags. For example, a CR image from one vendor may not be displayed optimally on another vendor's PACS, despite both products using DICOM. "As long as there are different paint jobs on most of these products, we need data normalization because they all have their special sauce," Gray says. "These games have been going on for 20 years, and we need the VNA to fix things like that." Even as organizations have begun to explore the potential of cloud VNAs, VNAs and cloud services have been evolving. Mitchell Goldburgh, manager of cloud imaging solutions at Dell Services, which makes the Dell Cloud Clinical Archive (DCCA), says cloud computing may refer to a physically remote location, but it can also refer to a method of delivery such as software as a service. Many organizations use the cloud for secondary storage, but as cloud storage has grown, Goldburgh says it is reaching a critical mass, allowing cloud vendors to provide more features less expensively. An important function for VNAs, Goldburgh says, is to help health care organizations manage their data more effectively. Advances in data management allow most facilities to keep 11/2 to two years of data onsite, while the rest of the data can be stored in raw form in the cloud; Goldburgh says one way to compensate for slower retrieval times is to keep larger studies, such as breast tomography studies, on the facility's local storage cache for longer periods of time. Goldburgh says users also want to interact more with their data. Universal viewers or VNAs that are interoperable with specialty viewers allow organizations to integrate multiple clinical applications directly with the VNA or image-enable their EHRs. In addition, some health care organizations are interested in data analytics related to their medical images. "As storage becomes a commodity, what do you layer on top of that storage to add value to the delivery model?" Goldburgh says. "On the S-curve of adoption, the ability to access and exchange data in the cloud is on the higher [more developed] end of that curve. What's on the lower [less developed] end of the curve is the spectrum of analytics that are available today and the promise of artificial intelligence in the future. I think there's a lot to be gained in the ability to aggregate disparate types of information and to have ready access in a platform that allows [providers] to deliver precision medicine." Paul Shumway, vice president at Novarad Corporation, which makes the MARZ cloud VNA platform, has seen strong interest in cloud VNA, especially in the past several months. He says many of Novarad's customers, especially large and medium-sized hospitals, have adopted cloud VNAs to enable enterprise imaging, usually starting with their non-DICOM images and later adding radiology and cardiology images. Novarad's customers can choose between storage in the MARZ VNA cloud or the DCCA cloud. After enterprise imaging, Shumway says health care organizations are interested in prior imaging from other providers. "Once they have a patient-centric viewer with everything in it, they want to be able to see what their patients have had done at other facilities," Shumway says. "Have they gotten an X-ray or CT somewhere else?" Accessing prior imaging from other providers can be a challenge, but most organizations would prefer to obtain that information digitally, rather than relying on patients to bring it with them. Shumway says cloud VNAs can facilitate that type of exchange. He thinks digital data exchange between health care organizations will become more common as more of them adopt the technology. Morris Panner, CEO of DICOM Grid, says cloud technology is changing the way health care organizations think about their data. He says providers want to be able to connect with their data in much the same way that consumers connect with Facebook: quickly and in a user-friendly way. He has also seen greater demand for data access on personal devices such as laptops and tablets. "You see this capability changing the way people interact. [One of our clients] had a neurosurgeon on an airplane with a 3G connection providing vital diagnostic information based on imaging that he was looking at on his iPad—while waiting for takeoff," Panner says. "The vendor neutral archive, now, is not just a repository of data, in case you want to switch PACS [providers]. It now is your core operational system. But that's only possible if you have a true cloud vendor." Panner says cloud VNAs are increasingly being used as a central platform that can connect disparate departments, EHRs, and medical devices—including 3D printers—and facilitate functions such as second opinions or transfer of care. Rather than being simple storage, he says VNAs are becoming enterprise and network systems. He believes this change will significantly affect health care delivery. "Everything that's interesting in health care now is starting to move outside the hospital. People are trying to bring the patients to the center of the experience, treat the patients where they are, get them out of the hospital as fast as possible, and keep them out of the hospital," Panner says. "Not just because it's an economical thing to do, but [also because it's often better for the patients]. There are certain things you might need done at a hospital, but you're starting to see [interventions that enable] the patient to have a better experience and the system to have a better experience, as well." Cloud VNA can be deployed in a variety of ways. New England Baptist Hospital (NEBH) in Boston, a 141-bed orthopedic specialty hospital, added DICOM Grid's cloud VNA to their operating rooms (ORs) in July 2015. NEBH still uses PACS as their primary archive for medical images, but they use DICOM Grid's cloud VNA for all of their outside imaging; this is significant because many of the surgeons at NEBH are private practice physicians who are affiliated with the hospital. Tyler N. Martin, senior administrative director of radiology at NEBH, estimates that 300 to 500 images are uploaded to the cloud VNA each week. He says the surgeons often use outside images for preadmission screening and surgical planning. "When they get into the OR, it's important for the surgeons to be able to view those outside images in the OR, if that's what they're using for surgical planning purposes," Martin says. "And the cloud-based system makes it extremely easy for us to segregate two different systems. So DICOM Grid houses all of our outside imaging that the surgeon may bring in, but it doesn't flow to our primary PACS system that houses all of the studies that are performed at NEBH. DICOM Grid will marry those two patient files together so that the surgeon in the OR can compare in real time the outside study with the study that's obtained at NEBH." With 16 ORs on their main campus, eight more at an ambulatory surgical center, and several remote offices, storing and accessing medical images is a critical concern. Martin says feedback from most of NEBH's physicians has been positive, and the system has more functionality than what NEBH used previously, although they are still upgrading cloud functionality in areas outside of radiology. Martin says technologists use the system to check images for quality and verify image counts, the hospital's imaging service uses it to burn CDs, and patients are able to upload images from home prior to an appointment, via a link on the hospital's website. In the future, NEBH plans to incorporate the patient link into NEBH's hospitalwide portal, which will allow patients to retrieve images, as well. The hospital is also working with some of its partner hospitals to electronically send images to emergency departments. Winthrop-University Hospital in Mineola, New York, also needs to maintain image availability among many physicians. A 600-bed teaching and oncology hospital, Winthrop processes approximately 500 studies a day. Rick Perez, administrative director for the department of radiology at Winthrop, says the hospital has been using Carestream Vue for Cloud-Based Services for six years. Although Winthrop's PACS keeps around 11/2 years' worth of imaging onsite, all medical images are also saved to the cloud. Perez says keeping more recent data onsite ensures that imaging will be available in the event of a power outage, while saving everything to the cloud provides a reliable backup. Winthrop is satisfied with that configuration but may consider expanding its cloud VNA use, as it considers adding more locations to its network and potentially sharing data with other providers in the region. "I think we'll start to look at other ways to use it, but I still think it's a work in progress," Perez says. "When we sit down and look at where information is needed, we talk about RHIOs [regional health information organizations] and [those types of arrangements]. The cloud seems to be a good way of being able to do that and [share our data, while maintaining] the integrity and the speed of our system." Facilitating image access across multiple locations is critical for many health care organizations. Elite Imaging, a multisite imaging center in South Florida, Pennsylvania, Delaware, and New Jersey, recently expanded from 13 locations to 41. Laura Kassa, director of operations for Elite Imaging, says cloud VNA is the center's workflow driver. Elite Imaging, which was already using eRAD's RIS, PACS, and reporting platforms, recently undertook a two-month adoption of eRAD's cloud VNA. Although Kassa believes that 10 months would have been a better timeframe, she says business considerations necessitated a quick implementation; she adds that she is pleased with the results. The biggest challenge with the implementation was data migration, Kassa says. She recommends that organizations prepare studies and patient information for migration before implementing cloud VNA. She recommends that staff be trained ahead of time, as well. Elite Imaging had their staff spend one hour a day in a test environment with a checklist of functions to perform prior to implementation. eRAD also provided onsite support at each location during implementation, and Elite Imaging set up a command center for call-in questions. To streamline workflow after the implementation, Elite Imaging standardized as much as possible. "Even though we are up to 41 centers, we believe in standardization so whatever the workflow is at one site, it should be the same for everyone. You shouldn't try to manage multiple workflows," Kassa says. "We want each CPT code to have one descriptor. We didn't want to duplicate CPT codes. We also put rules in place for authorization and conditional worklists. Now, each user can customize their worklist to make it look the way they want it to look, but we can also put items that we require on their view." Studies are routed so that they are waiting in the queue when the radiologist is ready to read them. The system's prefetch setting loads the first five studies on the radiologist's list in descending order and continues as the radiologist reads. Seth Koeppel, MBA, senior vice president of sales for eRAD, says that, by placing small servers onsite or, in some cases, installing software on workstations, eRAD is able to manage digital traffic and allow Elite Imaging to manage its workflow efficiently. "This is not just limited to archiving; it's much bigger than that. It is the whole workflow process ranging [across] RIS, PACS, speech, and [critical test results management]," Koeppel says. "The cloud reduces much of the ongoing costs and headaches associated with this very technical and ever-changing aspect of their business. 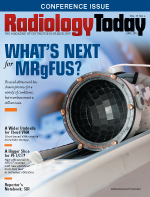 They want to be able to focus on the delivery of imaging services and not IT." • Specify the roles and responsibilities of all parties. • Define key terms, such as dates and performance. • Define key measures for performance by the vendor, and specify which party is responsible for measuring performance. • Specify when and how the agency will have access to its data and the transition plan in the event of contract termination. • Specify how the vendor will monitor performance and report results, as well as when and how the agency will audit to confirm performance. • Provide for disaster recovery and continuity of operations, including when the vendor will report outages and failures and how remediation will be done to mitigate the risk of recurrences. • Describe any exception criteria that applies to vendor performance. • Specify security performance metrics and data protections, and clearly define who will have access to the data. • Specify performance requirements and define the conditions, such as a data breach, that require the vendor to notify the agency when security requirements are not being met. • Specify a range of enforceable consequences or penalties for noncompliance with SLA performance measures. See the full report at www.gao.gov/assets/680/676395.pdf.